In 1949, what was once strictly a retirement program for ministers of the Church of God came into being. 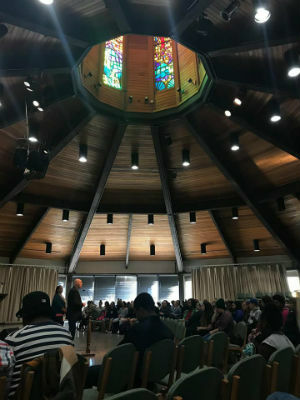 Not everyone was ready for such a program, however, as a few questioned the lack of faith in God’s provision that allegedly accompanied enrollment. Received initially with mistrust, Servant Solutions has since become one of the most trusted partners of the Movement. With time, training, and technology, the former Board of Pensions of the Church of God has morphed into the holistic ministry of “improving financial security for servants of the church.” As Servant Solutions nears its seventy-year mark in ministry, it’s clear that the endorsed agency of the Church of God looks very little like it did at the beginning. But that’s more than okay with our pastors and their families, our missionaries, our local churches, and our educators. They’ve been unleashed to do what God has called them to do, more confident than ever in the expertise and faithfulness of today’s Servant Solutions. Layperson, keep reading! You may not interact directly with Servant Solutions, but their work ultimately has an impact on you. Pastors already know this, but vocational ministry is nowhere close to lucrative. Making matters worse, the complications and peculiarities of IRS regulations related to churches and ministers can be frustrating and confounding, even for the most seasoned pastor. With Servant Solutions, pastors and churches, for instance, aren’t alone in the fight. They’ve got someone to walk alongside them, not only in saving for the future, but also in dealing with financial matters now. This frees ministers to focus less on how they’re going to make ends meet, and more on loving, teaching, and reaching people in the name of Christ. Jeff Jenness addressing a crowd at Warner Pacific. The past seven or eight years have also brought on a more obvious change. It was actually in 2013 that the agency’s name changed from the Board of Pensions to Servant Solutions. “Thank the Lord, there was great acceptance from Day One,” Jeff recounts. “We weren’t sure, as the Board of Pensions had been such a trusted name. But we had found in our conversations with churches across the country that the name was a confusing term. The term pension had kind of gone by the wayside, where an individual worked so many years while the employer put money aside, promising to pay monthly, based on years of service. That wasn’t practical, and it hasn’t proved practical in the secular workforce, either.” Today, Servant Solutions use defined contribution plans that amass money and utilize the power of investment strategy. Servant Solutions is thriving and growing today, and it’s no wonder. The level of service continues to bless the Church of God—and beyond. Following a recent approval to work with theologically and relationally compatible ecumenical churches, small denominations, and institutions of higher education, they’ve further demonstrated their willingness to live out the unity of Christ, reaching their hands in fellowship to every blood-washed one. This has not only added to their growth, but also demonstrated their reputable quality of service. So, when Church of God Ministries, Warner Press, and Christian Women Connection relocated offices across town in Anderson in 2016, it was a no-brainer for Servant Solutions to go, too. Their previous location, a house that had been converted for office space on 7th Street, worked well for a time, but they were bursting at the seams. More importantly, according to Jeff, Servant Solutions loved the idea of carrying out their ministry so near these other agencies of the Movement. 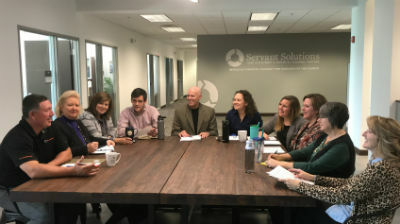 In this new proximity, Servant Solutions and Church of God Ministries have worked together to bring CARE and ChurchExcel to the Movement, sharing personnel and resources. It’s been a win-win! This entry was posted in All Church of God and tagged Board of Pensions, CARE, ChurchExcel, endorsed agencies, endorsed agency, finances, financial, funds, investment, IRS, Jeff Jenness, money, pastoral compensation, pension, planning, portfolio, retirement, Servant Solutions, taxes. Bookmark the permalink.